DIY VIDEO: How to Make an Edible Water "Bottle"
Our recent article about an innovative edible water "bottle" designed by three London-based students was so popular that we decided to try our hand at making one ourselves. Called the Ooho, Rodrigo Garcia Gonzalez, Pierre Paslier and Guillaume Couche's blob-like creation is a no-waste alternative to plastic water bottles since the gelatinous membrane that surrounds the water can, itself, be eaten. Check out our DIY video showing how you can create a similar water blob at home using a process called spherification. Note: The Ooho is made using sodium alginate and calcium chloride using a formula developed by the designers. Our recipe is an approximation that replaces calcium chloride with calcium lactate, resulting in a membrane that is less tough. Add 1 g of sodium alginate to 1 cup of water. Then use an immersion blender to dissolve the sodium alginate. Once you’re confident that it’s dissolved, set the mixture aside to get rid of any air bubbles that may have formed during blending. Add 5 g of calcium lactate to 4 cups of water and mix well using a spoon. Scoop up some of your sodium alginate solution using a deep spoon. Very carefully plop the sodium alginate into the calcium lactate bath. Repeat with the remaining sodium alginate but do not crowd the bath. Stir the sodium alginate bubbles very gently for 3 minutes. After 3 minutes, remove the “bottles” from the calcium lactate bath using a slotted spoon and transfer them to a water bath to stop the reaction. And there you have it! 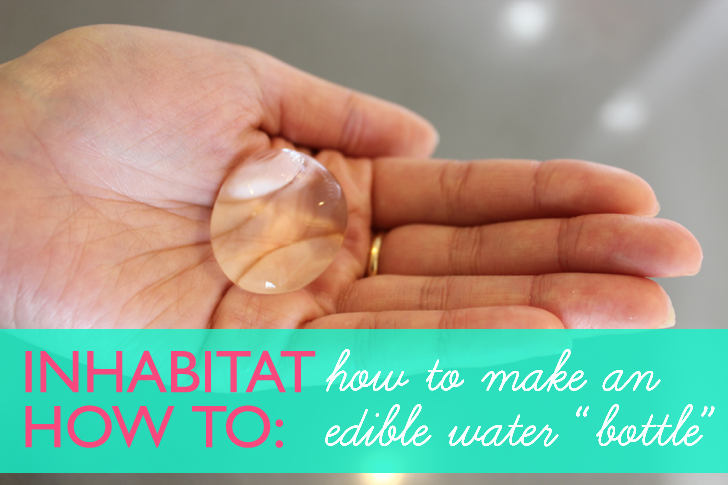 Your edible water “bottles” are ready for drinking, er, eating, or whatever you want to call it. Did you try this DIY at home? How did your water blobs turn out? Or do you have a better spherification recipe of your own? Let us know in the comments below. Hi Yuka, I would like to know if you have information about the weight or the measures of Edible Water “Bottle””. Here is a link where you can purchase it: http://www.molecularrecipes.com/hydrocolloid-guide/calcium-salts/ Hope that helps! I am trying your experiment it's really nice but as you have mentioned that we can use Calcium Chloride instead of Calcium Lactate,right? So, please suggest that do we need to use the anhydrous form of Calcium Chloride. The Heinlein story "The 8th Day of Creation" described beverages packaged like that. Hey can you dissolve the liquid and then leave it alone for 8 hours then use it???? it don't work i have tried it. its fake. Are the bubbles fragile after that whole process is complete? Say I were to store it in a cuboid-shaped container, would they burst? Can these be frozen and still be intact after thaw? Im assuming you cant just throw these "bubbles" into your backpack and go?? This would work great as an animal cell model. Do you know if it would hold together to use in osmosis experiments? I might have a go at this?! Are those safe to travel? would they not break en-route? Whoa, you did it! How cool. How did it taste? STEP 1: Add 1 g of sodium alginate to 1 cup of water. Then use an immersion blender to dissolve the sodium alginate. Once you're confident that it's dissolved, set the mixture aside to get rid of any air bubbles that may have formed during blending. Add 1 g of sodium alginate to 1 cup of water. Then use an immersion blender to dissolve the sodium alginate. Once you're confident that it's dissolved, set the mixture aside to get rid of any air bubbles that may have formed during blending. STEP 2: Add 5 g of calcium lactate to 4 cups of water and mix well using a spoon. STEP 5: After 3 minutes, remove the "bottles" from the calcium lactate bath using a slotted spoon and transfer them to a water bath to stop the reaction. After 3 minutes, remove the "bottles" from the calcium lactate bath using a slotted spoon and transfer them to a water bath to stop the reaction.